CASK ALES. OUTDOORS. FOOD TRUCKS. LIVE MUSIC. HEATED TENTS. 30 BREWERIES. FIRE PITS. HAPPY FIRKIN’ HOLIDAYS. FULL BREWERS LIST IS NOW AVAILABLE! 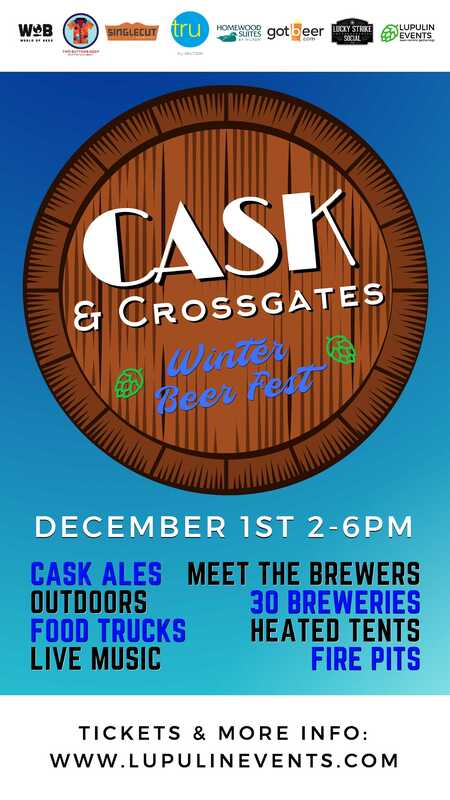 Join us on December 1st from 2-6pm for CASK & CROSSGATES – Winter Beer Fest. The festival will be located just steps away from the *brand new* tru by Hilton and the Homewood Suites by Hilton and Crossgates. 30 breweries will bring hand-produced casks, as well as standard pours of their amazing beer. Don’t miss out on this opportunity to enjoy unique offerings from some of the best local breweries, all while you dance and groove to our live music on the SINGLECUT STAGE. Purchase your tickets on sale now for $45 ($55 at the door) by SIMPLY CLICK HERE. Also, get the “tru” experience by booking a $99 tru by Hilton hotel room with breakfast!